The new release is available at http://www.f1oat.org/pycloid/index.html. Hope some CG artists will post very soon nice films done with PyCloid ! Any chance you'll be creating a Mac version. I'd buy it in a minute! I have done some experimenting with your beta fluids. The fluid simulation works great, but had some trouble figuring out what what settings did what. In the Isosurface tab, I found a radius adjustment, and in the fluid tab there is also a radius adjustment. In the radius adjustments, if I choose a setting much over 0.017 the particles disappear. My render really doesn't do justice to how good the water flow can look, but be assured, it works very well when animated ! I also found that the simulation does not reset to zero time when hitting the rewind button. To reset the simulation, rewind to 1-second, then to zero, or your animation render will show the last frame before starting the animation at frame zero. McGuiver, can you post a youtube clip of your fluid sim? Yes, there are many things to tune in the code, but as the pressure from users was high, I decided to release it ! The "Radius" parameter in "IsoSurface" tab applies only to rendering. Both values should be similar, but I keep two different sliders to experiment. 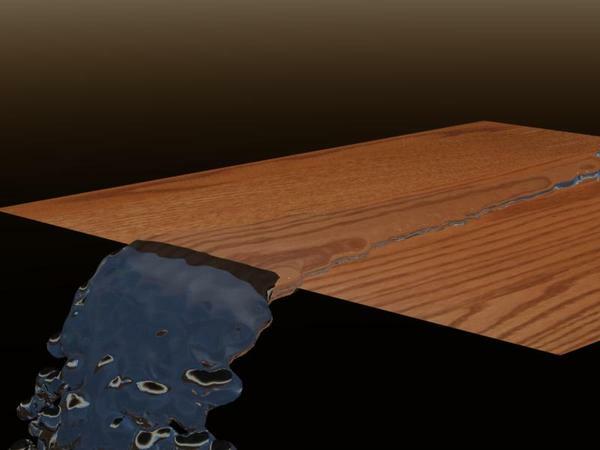 IsoSurface applies to all PyCloid particles simulation, including those without fluid behavior. Yes, there is something to fix for rewind function. I have to update the PyCloid website with some docs about fluid. What is difficult is to achieve stable behavior, with no "explosion". 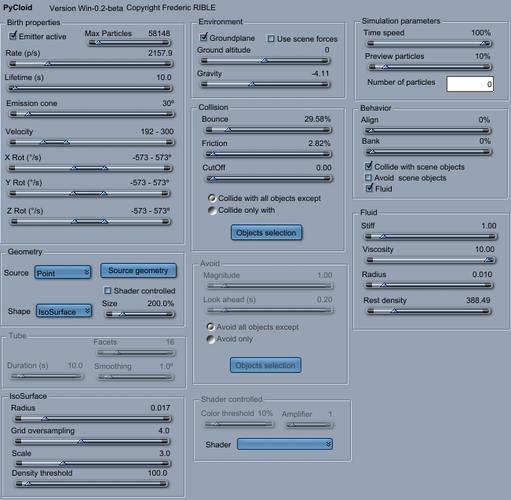 That is managed by tuning all the parameters, including gravity, but I do not yet have a magic worflow for that ! Let's experiment and share results. Unfortunately, I can't seem to get a YouTube account working....just keeps kicking me out ???? Can you try Vimeo instead? Attempting to imbed a video of second water test. Edit: Well....that didn't work, I'll try the url. Though I have no idea what tags to use to get the video embedded in the forum. We can hope! It looks very cool and is certainly a product I will support. Any new Pycloid animations out there? Does anyone have any suggestions on how to create a flame effect like this with Pycloid and Carrara? This is amazing. I can hardly wait to test it out. Would it be okay to offer freebie CAR scenes that require (but do not come with) PyCloid? Thanks for this, will be donating soon. Yes, you can publish freebie scenes using PyCloid. I will be very happy to see artistic works using it. Some activities around this plugin should motivate me to continue the development ! Does it work with Carrara on OS X yet? I don't know why I haven't been playing with this yet. Totally swamp at the moment... but I think this even works in swamps! So I'll see if I can get testing by the end of the week. Looks really cool and I love McGuyver's work on it. Everyone wants fluids in Carrara - this makes it (and much more) happen! This is definitely worth playing around with. Thanks for your development Frederic. I need to check this out more for sure. It seems like it has many possibilties indeed. Can I create a simulation of water in Carrara and import in DAZ Studio it work? Particles and realistic ocean are internal into Carrara. The best thing to do is to import all your DS scene into Carrara (and I think you'll never back to DS after that ! ). Then you can use all of Carrara's features and plugins.